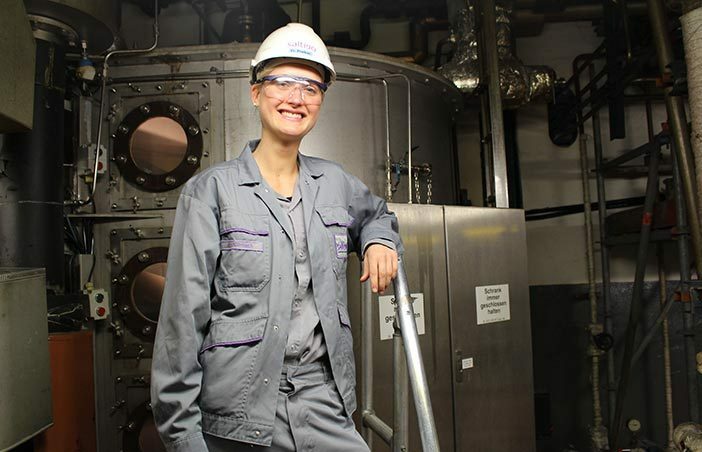 As part of her trainee programme, Leonie Prudent worked for two and a half weeks on alternating shifts at Saltigo’s Leverkusen Plant 2. A fascinating experience for the human resources trainee. Many of our operations would be glad to have someone like Leonie Prudent on the team, as the 27-year-old is not only intelligent, but also open and natural. No wonder she was quickly accepted by her colleagues at Saltigo Plant 2, when she worked with the relevant shift in each of the three operations (CLC, HDK and DHA). The work placement in which Leonie, who was born in the Rhineland, worked on the alternating shift, is part of the LANXESS trainee programme in which 16 university graduates have taken part since last Autumn. Contrary to expectations, it was not the night shift, but the early shift that Leonie found most tiring: Getting up at 3:45 a.m., in order to arrive punctually for the handover at 5:30. “That really wore me out, especially as the early shift is particularly busy”. Overall, the work placement in Production, which is male-dominated, was a “fascinating experience, which familiarised me with the core business and gave me a first impression of how the workforce here ticks. In human resources it is certainly useful to be aware of the particular needs of the production operations”. The amateur basketball player, who played in the premier league at university, and has been active in the second league since she started work, was not nervous about the work placements in the factories. On the contrary: “I looked forward to my time in the factory, and it exceeded my expectations: Everyone was really friendly to me and welcomed me into the team”. Dr. Dirk van Meirvenne, Head of AII 5QUALITY PERFORMS.